Cardiovascular disease is the leading cause of death and disability in the Western world. 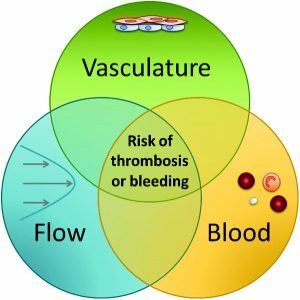 In addition, abnormal blood clotting contributes to the pathophysiology of many diseases, including cancer, infection, and autoimmune and inflammatory disorders. In our lab, we focus on cellular, biochemical, and biophysical mechanisms that mediate blood coagulation, with the goal of developing new treatments for blood disorders. Coagulation occurs after cellular proteins are exposed to flowing blood, triggering a series of enzymatic reactions that culminates in the production of thrombin. Thrombin then activates platelets and cleaves the plasma protein fibrinogen to fibrin, which polymerizes into a web-like mesh that reinforces the blood clot. To examine events leading to blood clot formation, we utilize a variety of state-of-the-art technologies along with in vivo, ex vivo, and in vitro models. Our approaches have revealed novel, clinically important information about mechanisms that promote clot formation in hemostasis and thrombosis. Complications of abnormal blood clotting are the number one killer of Americans today. Heart disease is the number one cause of death in American women – more than all forms of cancer and the next four leading causes of death combined. Recent estimates suggest that one in every two men and one in every 3 women aged 40 and under will develop coronary heart disease in their lifetime. Thrombosis is the most frequent cause of death in cancer patients. Severe bleeding complicates approximately 10% of open-heart surgeries. Annually there are over 1 million cases of bleeding in the US that are the primary cause of hospitalization. More people die of arterial thrombosis than from cancer; more people die from venous thrombosis than from accidents.